The Big Fat Punjabi Wedding is like the heat-and-eat curry of comedies of errors - just add a giddy college boy, a flighty siren whose "hips might lie but lips don't", a father more enamored of his new Maruti Ertiga than his son, and, lest we forget, the Ertiga itself. In Mere Dad Ki Maruti,Tej Khullar (Ram Kapoor) buys a Marutthi Erteega for his soon-to-be-son-in-law, which sticks like a bone in the throat of Khullar's son Sameer (Saquib Saleem), who has to resort to his friend Gattu's (Prabal Punjabi) cycle rickshaw to get about town. Meanwhile, Sameer also has serious hots for Jasleen (Rhea Chakraborty), nay Jazzleen. Long story short, Sameer steals the car that his father says is LOVE (actually LUV - Life Utility Vehicle, which, as it happens, is what the car is being marketed as), takes Jasleen to a party, and owing to a mildly racist set of circumstances, ends up losing it. The rest of the movie is a mad scramble to keep Sameer's formidable father from finding out what happened to the car. And with her path thus set, all writer-director Ashima Chibber has to do is ensure that the viewer is constantly entertained, which she doesn't quite manage. Don't get us wrong. There's plenty that's funny about this movie. It's just that the plenty does not include the two leading boys, who, unfortunately, occupy most of the screen space. Most of the interactions Gattu and Sameer have with others involve them going "Please, please, please, pleeeeeeeeaaaaaaseeeee.....". They're too boring to hold your attention for long. Some of the slowest-paced parts of the movie, i. e., those involving chasing down the cars, should by rights have been the funnest bits of it. What does turn out to be fun is the supporting cast. Ram Kapoor is loud, extravagant and having the time of life - right from drunken rants on "crupshan, crupshan, crupshan" to withering his son with a single disparaging glance. Rhea does exactly what she needs to - no more, no less. Chibber does a great job at using music, colour and attitudes to take us into a candy-flossed Chandigarh where a drunk girl who goes around drawling "Hot Wheeels!" to anything male and, well, possessing a set of wheels, will promptly be picked up by the police and dropped off at her home. The camera work is pretty spiffy, and every frame is pleasing to the eye, rather than being an over-Punjabified assault on your senses. And, the peppy music will keep you awake when the going gets S. L. O. W.
Verdict: This is one ride that is better when taken from the comfort of your couch at home. You can save your dough for better movies. 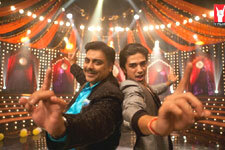 Be the first to comment on Mere Dad Ki Maruti! Just use the simple form below. fullhyd.com has 700,000+ monthly visits. Tell Hyderabad what you feel about Mere Dad Ki Maruti!